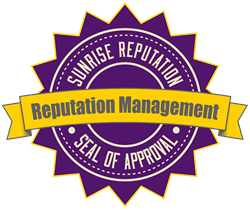 Reputation management consultants at Sunrise offer a flat fee for a DIY approach to reputation management. This new service cuts some of the cost and allows the client to take a proactive approach to handling their online reputation problems including mugshots, Rip Off Reports, Scambook listings, negative Yelp reviews and more. Sunrise Reputation can help with online libel. Libel is the false publication of information in written form that damages someone's reputation. Online libel is just that, negative information that is false and damaging to an individual or business reputation. Libel can be harmful for many reasons and can often be blamed for the loss of a job. If the negative information posted is true, it is not considered libelous. Defamation can include statements that are harmful but true. Sunrise combats both libel and defamation. The new DIY approach from Sunrise allows for small companies and individuals to do a lot of the work themselves while being guided by the reputation experts at Sunrise Reputation. "Not everyone can afford to have reputation management done for them. Other people want a more 'hands-on' approach. In either case, we become the reputation management consultant and allow the small business or individual to do more of the work themselves with our coaching," says owner Brandon Hopkins. Individual reputation management presents challenges not seen by corporations, specifically financial challenges. Hopkins explains, "Many of our customers who are looking for individual online reputation management services don't have the same resources that a corporation does. They consider their budget and where the money will come from. Corporate reputation management sees the need and can allocate funding to meet the need." Corporate reputation management has it's own unique set of challenges. "Unlike an individual, corporate reputation management often has many people involved. When publishing a press release for example, you need the approval of the marketing department as well as the president of the company. The president might be away on a business trip and the marketing department is overwhelmed by a large campaign, that can lead to delays that aren't seen with individuals. In this case, we try to build a relationship and gain the decision makers trust so that we can keep moving forward without approval on every single actionable item. This leads to quick results and happy customers," explains Sunrise Reputation owner Brandon Hopkins.